Portsmouth’s unbeaten Light Heavyweight prospect Joel McIntyre gets his first taste of Championship action later this month, when he faces Tichfield’s Danny Couzens for the International Light Heavyweight International Masters title at the TRAD TKO Events promoted BRAGGING RIGHTS event at South Parade Pier in Southsea, on Saturday 30th November. Joel’s journey to potential Championship honours began with a chance meeting with local hero, WBU Light Heavyweight World Champion Tony ‘Oakey Kokey’ Oakey, who first noticed the young scrapper aggressively attacking the heavy bag at a local gym and offered his advice. After a year or so nurturing the youngster, Tony decided to introduce Joel to his manager and coach, the esteemed Johnny Eames, head honcho of the famous TRAD TKO Boxing Gym in London. Johnny happily welcomed the talented youngster to the team and, with Tony’s support, began guiding Joel through a series of low key fights, mainly at local shows in the Portsmouth and Southampton area. After six resounding victories Johnny, and then recently engaged coach John Murray, felt the time was right to introduce Joel to ‘the big stage’ and negotiated an slot on the undercard of the John McDermott versus Matt Skelton title battle. Joel came through the test with flying colours, with an excellent points victory over Darren McKenna, in doing so convinced both his coach and manager that he was just a fight or two away from a minor title shot. Two further top class wins, over Mitch Mitchell and Jody Meikle, that followed convinced Johnny and John that Joel was ready to step up to the plate and compete for his first title. If those wins hadn’t convinced the pair that Joel was ready, then his regular full on sparring sessions with British and Commonwealth Middleweight Champion Billy Joe Saunders and star prospect Super Middleweight prospect Frankie Buglioni, clearly would have, as the Pompey lad really came into his own against two of the top talents in the sport today. Following his latest sparring session with Frankie Buglioni, Joel took a little time to talk about his upcoming title fight. “I’m so pleased to be fighting for my first title and it’s in front of a home crowd as well. I’m really up for it, I’ve never been this up for a fight before. It’s going to be a proper derby, he’s from Tichfield, so people are saying Southampton versus Portsmouth, so that’s even more reason to get in there and have it. He says he’s had better opposition before, that doesn’t matter, he’s never fought me, that’s all I’ve got say. To be fair to Danny, we get on quite well, we’re pretty respectful to each other, but I’ve said it before I’m not losing this fight, I’m seriously up for this fight. This will be the first serious step up for me and I’m really excited by it. Been sparring with Frankie Buglioni for the past few weeks, three days a week, it’s always good sparring, so good we should be charging for tickets on the door. Frankie’s a very good fighter, you don’t get away with things twice with him, he learns from his mistakes, the same with me, if he catches me with a good shot, he wont do again, so we’re both learning from the sparring. You have to be switched on when you spar Frank, I think he feels the same about me, it’s really good sparring. I come up to the TRAD TKO Gym on Monday and stay to Wednesday, and other weeks come up on Wednesday and stay until Friday. 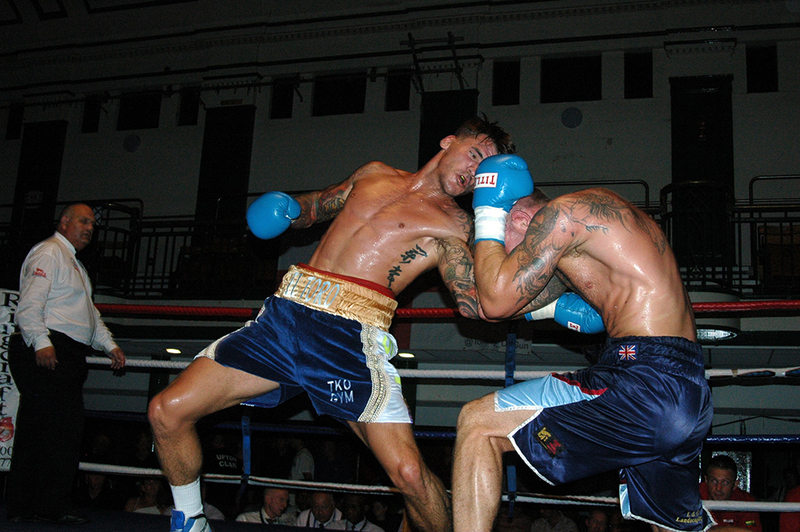 I have to say a big thank you to Tony Oakey, it was him that in me from day one, now I’m fighting for my first title. He’s not that involved in things these days, as far as training goes, but we do still keep in touch. Every story has a beginning, middle and an end, Tony was definitely my introduction, he bought me up to the TKO, when he was still fighting, I was training with him for his last fight and I went to his last fight, sat ringside. Joel McIntyre versus Danny Couzens, International Masters Light Heavyweight Title clash, headlines the Johnny Eames TRAD TKO Events promoted ‘Brothers In Arms’ event at York Hall in Bethnal Green, London on Friday 18th October 2013.